During most of the year I am not what you would call a "beer drinker". I'm more of a red wine kind of gal. But during the few warm summer months here in Michigan, I really enjoy discovering and sampling the wondeful plethora of craft beers that are out there -- especially those by local breweries. 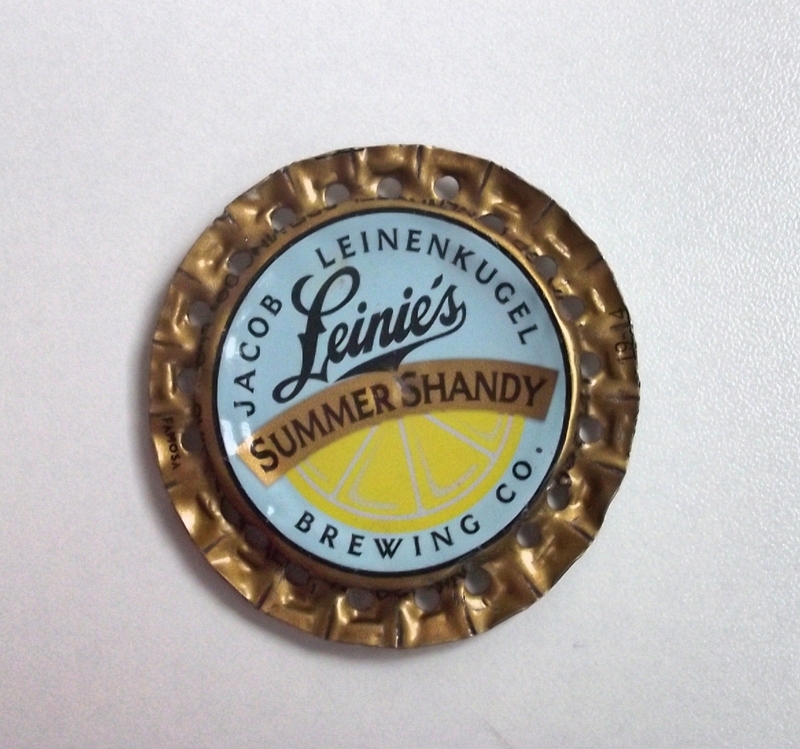 I also have a longstanding habit of collecting bottle caps. I'm not sure why I collect them. I guess like wine corks, I just always look at them and think: I can't throw these away. They're small and cool-looking, and I might find some use for them in the future. And this summer, I did! Craft beers have become so popular, that I decided to use the bottle caps to create summer earrings. With the incorporation of some beads, some thread, and some crochet ... Voila! 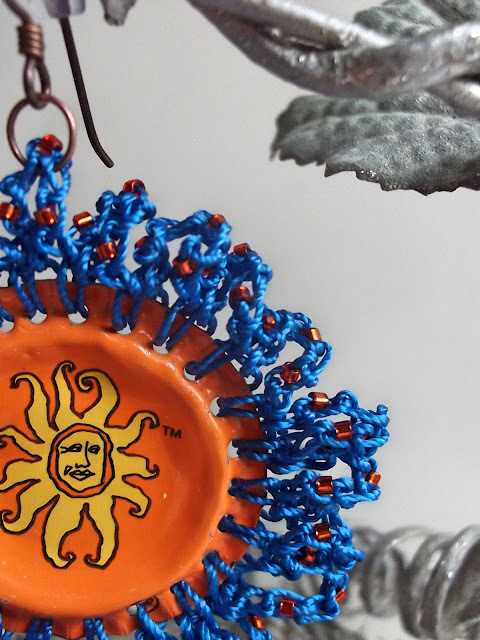 Take a look at some of my crocheted "craft" earring creations, and then I'll give you a quick, basic explanation of how you can make them yourself. 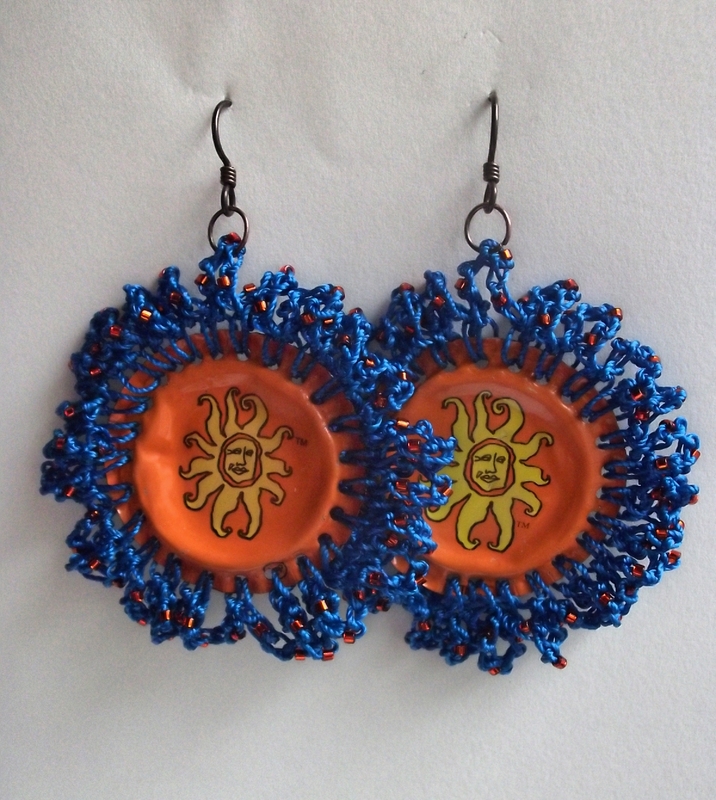 These bright, beaded beauties were made using caps from bottles of Oberon Ale, brewed by Bell's Brewery located in Kalamazoo, Michigan. The edging was crocheted with C-Lon cord and tiny bright orange delica seed beads. This next pair used bottle caps from Arcadia Ale's London Porter. Arcadia is another local brewery, also located in Kalamazoo. 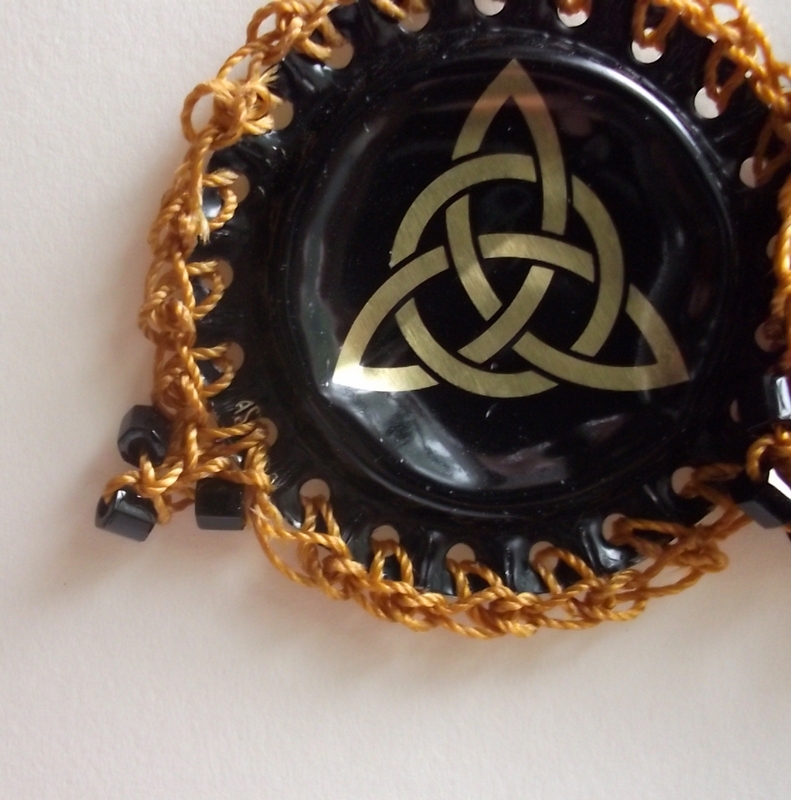 For these, I again used C-Lon cord and a bit larger, black delica seed beads. 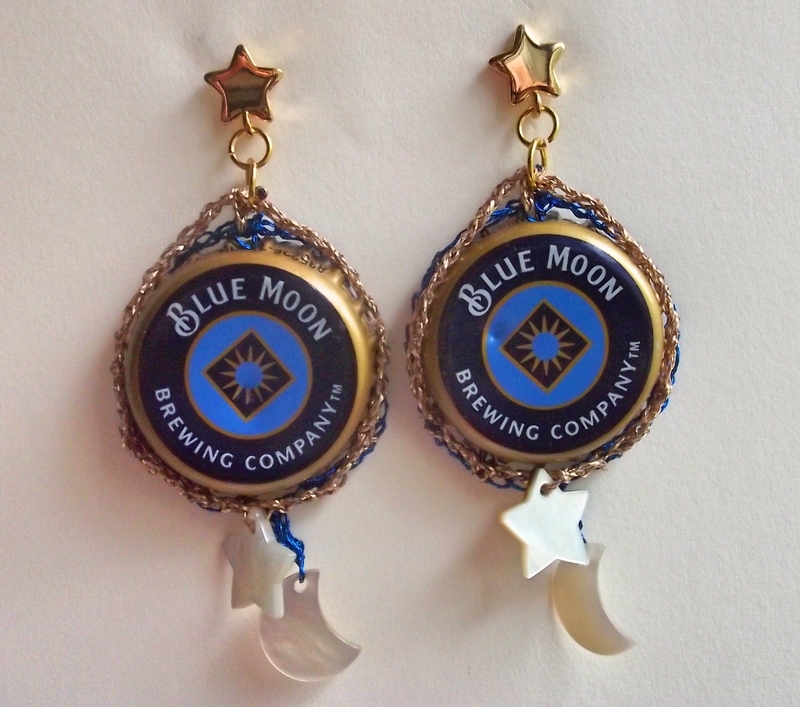 I had some fun shell beads in the shape of moons and stars that I used, along with metallic thread to make these earrings using bottle caps from Blue Moon White Belgian-Style Wheat Ale.. It's brewed by Blue Moon Brewing Company in Colorado. Making these crocheted "craft" earrings is super easy once you understand the basics. 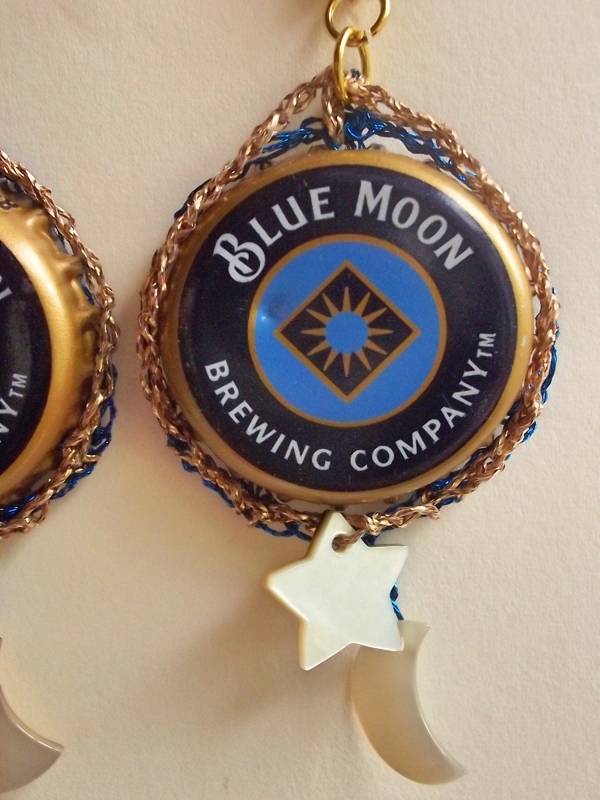 You probably noticed that with the Blue Moon earrings, I did not flatten the bottle caps, but I think you have more options, and the thread edging lays more nicely, if you do flatten out the edges. 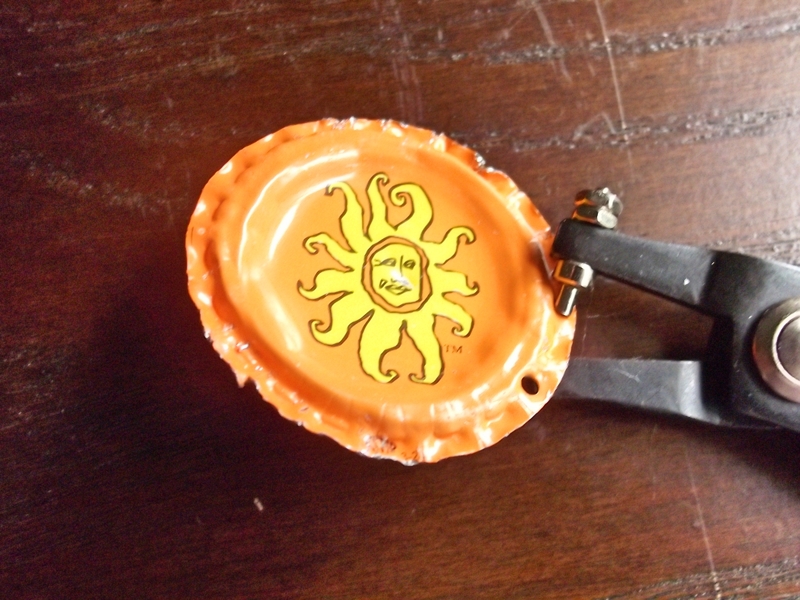 After much trial and error, I learned that the best way to accomplish the flattening is to first use a pair of pliers to bend the edges of the bottle cap out, as shown below. That way, when you use a hammer to flatten it, the edges will go outward as you want them to, rather than bending inward and deforming. 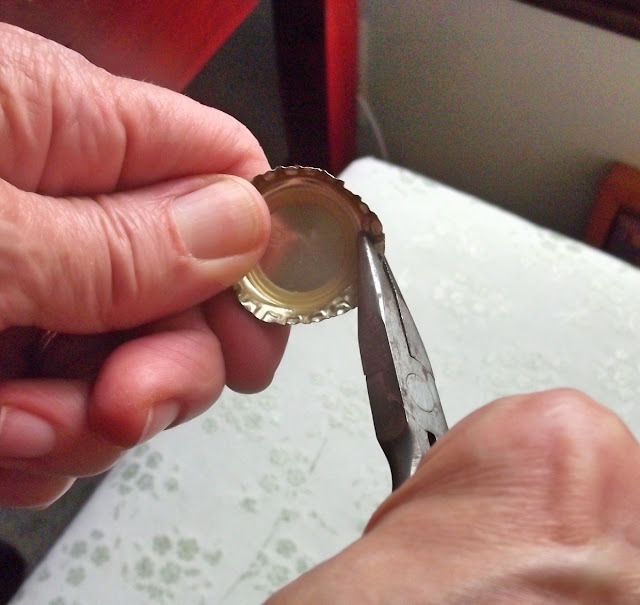 Once you've bent the cap edges out, you want to then place the bottle cap, top facing up, on a hard surface that can withstand impacts, Place a cloth towel, or even a doubled paper towel over the cap, to prevent scratching the surface, and then pound it with a regular, household hammer until it is flat. After it's flat, take a hole punch that is specifically made to punch through metal (such as this one by Eurotool), and punch your holes around the edge. It is best to wear safety goggles to protect your eyes, just in case the tiny pieces of metal fly up as you work. Once you have your bottle caps prepared, it is simply a matter of choosing the thread you wish to use, stringing on your beads, and crocheting along the bottle cap edge in the stitch pattern of your choice. Just be sure to choose a crochet hook that will fit through the holes you've punched. I used a 1.8 mm hole punch and a size 1.25mm crochet hook. 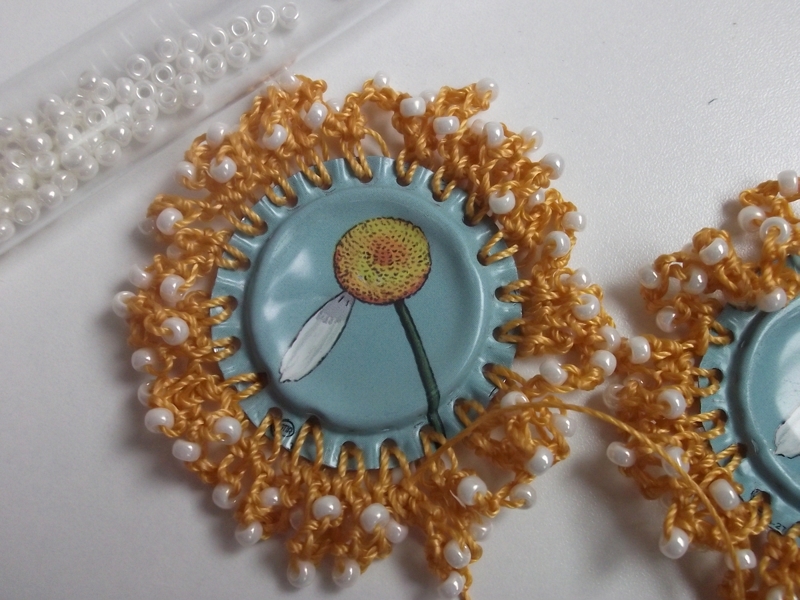 For the Oberon and Smitten earrings, I joined the thread to the bottle cap with a single crochet into one of the holes (with the back of the cap facing me, so the beads would appear on the front), I worked 7 chain stitches, with a bead worked into the even stitches (2nd, 4th, 6th), and then worked a single crochet in the next hole. 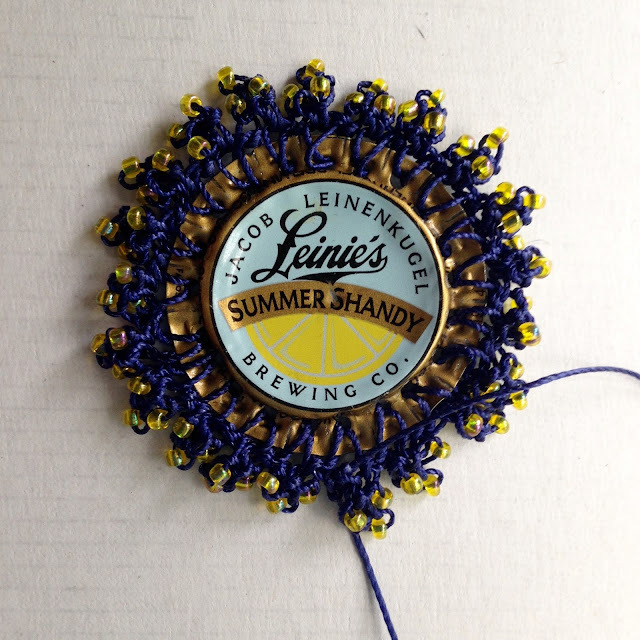 I continued all the way around the bottle cap and after working the last set of 7 chains, joined with a slit stitch to the first single crochet. Of course, as always, you have to fasten off and work in your ends on the back. I like to add a touch of fabric glue to my knot to keep things secure. You can really use any kind of stitch pattern you wish, as long as it works well between the edging holes. For example, on the Leinenkugel Summer Shandy cap below, I worked a pattern around the edge as follows: single crochet into the hole, 1 chain, [3 beaded chains, slit stitch into the first chain] (which makes a beaded picot), chain 1, single crochet in the next hole. 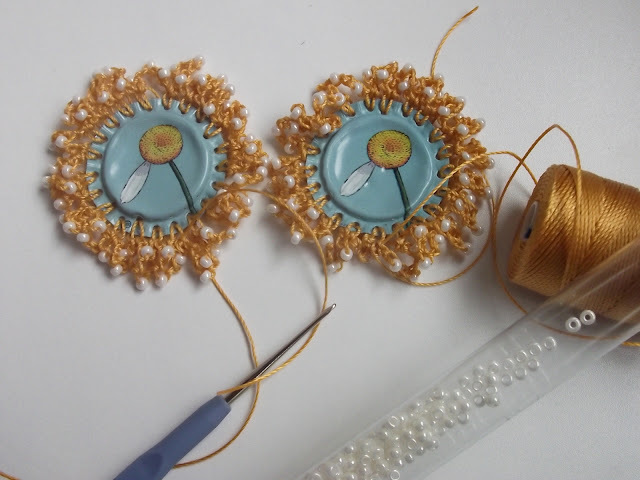 To complete the earrings, just attach a jump ring through the crocheted edge on each bottle cap and then attach the jump ring to earring posts or wires of your choice. 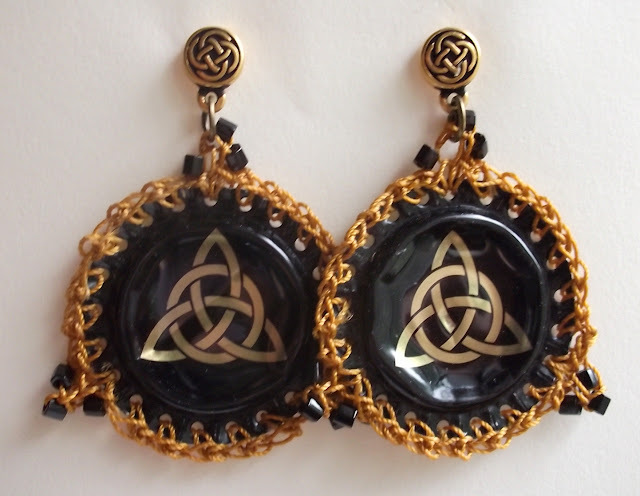 So crack open a couple of ice cold bottles of your favorite brew (one for you, and one for a friend or your sweetie), and make yourself a pair of summer earrings! Enjoy!